Dr D Digs Up Ancestors: BIG Y: My First Genealogically Relevant Find. The first thing I learned from the BIG Y test is that the Virginia Group 1 Dowells in our surname DNA project can finally be moved out of the logjam at SNP M222. What? You didn't know that they were jammed up there? Read on. One of the first things we learned in 2004 in our surname project was that my Maryland Dowells were not recently related to the Virginia Group 1 Dowells. Previously we had assumed that we were closely related. We had our own variation of the multiple brothers myth. I'm sure you have heard a similar tale about one or more of the lines you have researched. It goes something like this. Two (or four) brothers came across the Atlantic. When they disembarked one went north and one went west. Which ever branch you descend from never heard from the other branch again. Of course there is enough truth in some such stories that they need to be investigated. However, most of them have remained impossible to verify. One of the Dowell versions I heard decades ago was that four brothers came over from Wales. I still don't know exactly where my Dowells came from before they revealed themselves in Maryland. Prior to 2004 the working hypothesis among Dowell surname researchers was a variation of the migration myth that claimed upon arrival in Hampton Roads one Dowell turned right and sailed up the Chesapeake Bay and the other continued up the James River. Waterways were the interstate highways of the time so this story had a ring of truth. Based on this story many of us assumed that if either group would be able to extend its paper trail just one or two generations further back, we would find our common male Dowell ancestor. Then came yDNA testing. It soon became apparent that the two groups of Dowells shared the surname only by historical coincidence. Biologically, we were no more related that we would be if we each had different surnames. Our closest shared male ancestor lived at least three thousand years ago -- long before surnames were adopted. These two groups remain the two biggest clusters in our project. SNPs (pronounced "snips") are permanent changes in a person's DNA that are passed down to all descendants. 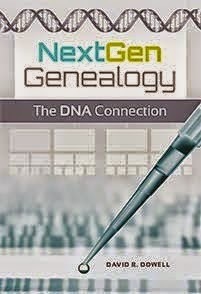 yDNA SNPs are permanent changes that are passed down by fathers to all their sons. As we have learned more about yDNA SNPs, we been able to sketch in more and more of our ancient ancestral lines. The BIG Y test has offered many of us an unprecedented chance to explore our SNP history in much more detail than had previously been available. This is not a test for novices. Even most of us who have considerable experience with genetic genealogy are overwhelmed by the results that are coming back. Both groups of Dowells descend from a large haplogroup (ancient clan). Membership in this clan is distinguished by a mutation located at position called R-L21. 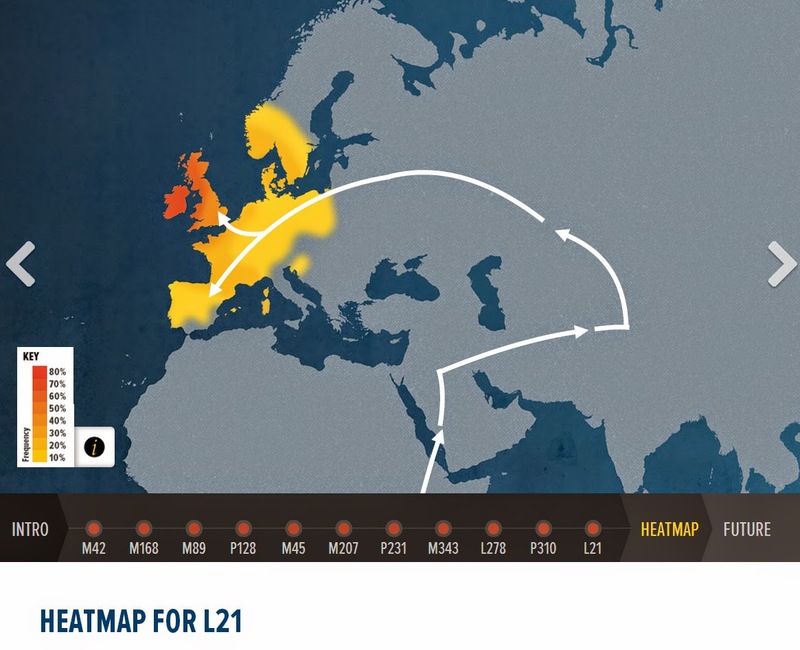 The heat map below is from my results from the Geno 2.0 test at National Geographic which focuses on deep ancestry. The more intense the yellow and finally the red become, the larger percentage of the population carry this SNP. You will note that men who carry it are very prevalent along the Atlantic Coast of Europe and have particularly heavy concentrations in the British Isles. The chart below shows what we thought we knew about where the two groups of Dowells had traveled down the SNP highway of history before BIG Y. The top of the chart has been truncated for simplicity. It begins as our ancestors migrated out of Central and Western Asia. You will note that L21 is represented by a green box in the upper middle of the chart below. We are very fortunate that a group of dedicated and knowledgeable citizen scientists also belong to the group and have done an immense amount of work to sort all this out. You may click on the chart to open a larger version in your browser. Before BIG Y we knew that the SNP flow of the Maryland Dowells had continued down to DF13 -- the green box just below L21 above. 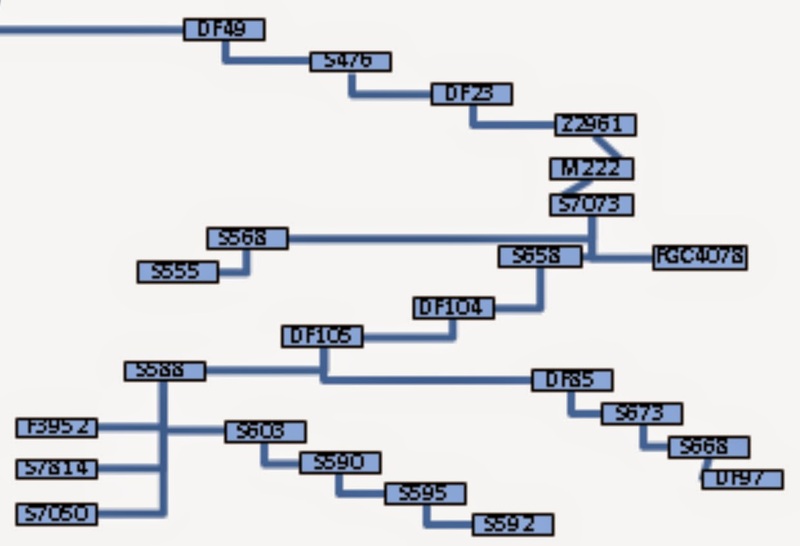 Then we could find no more recent SNPs. 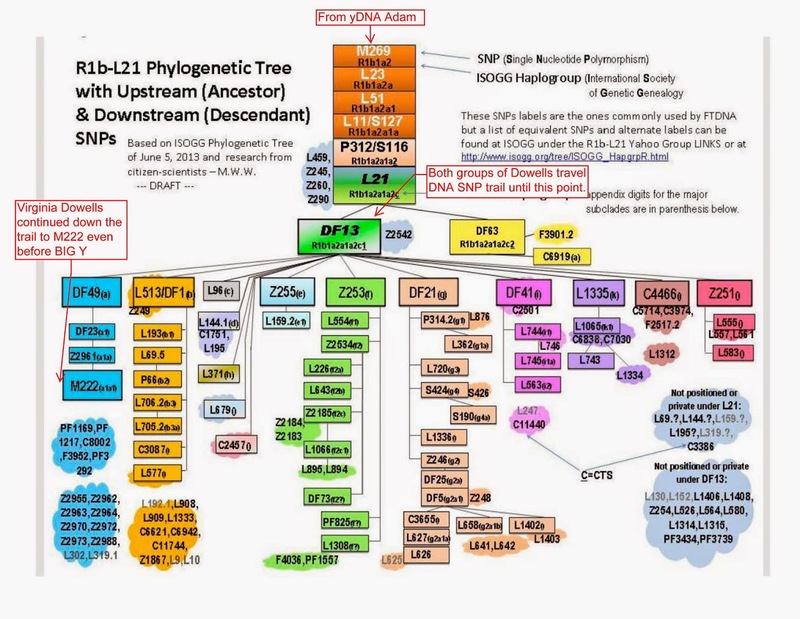 On the other hand the Virginia Group 1 Dowells could be traced through more recent SNP mutations down the left side of the chart to SNP M222. 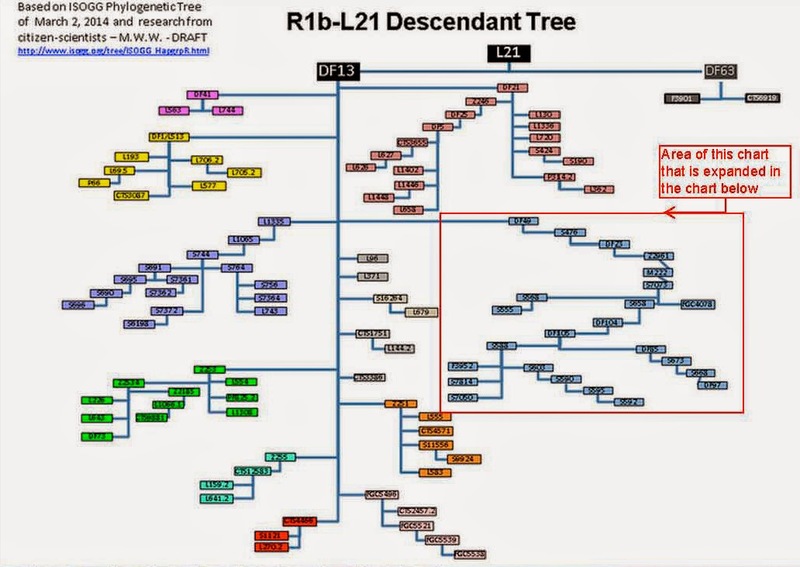 Can you trace the path of SNPs from M222 in the fifth row of the family tree down to DF97 in the lower right corner of this last chart? It is sort of a connect-the-dots exercise for genetic genealogists. The Virginia Group 1 Dowells followed that genetic trail. That is what I have learned so far from BIG Y. How do I know that? The one Virginia Dowell who participated in BIG Y tested positive for SNPs DF85 and DF97. That means he also would be positive for the intervening SNPs along the connecting line from M222 down to DF97. I hope we will be able to learn more from the massive amount of raw data that came back from this one test, but this is quite an advancement of our knowledge of the migration of the paternal ancestors of the Virginia Group 1 Dowells. Now we have to put it all into historical context -- a daunting task.